"Night of the churches“: a cultural event In the Ludwigskirche in Saarbrücken. The central elements that come within the domain of the life of the local parish – worship, pastoral care, social work, education and fellowship – all of these can take very different forms. Where one local church is at the moment offering a special involvement with children, another one may perhaps be focusing on church music, whilst a third one is concentrating on being a “reliably open church” in the city (emblem awarded for churches that guarantee to be open for visitors during the week). A few years later the key focus may easily be set to something different, as each living congregation changes according to the people who belong to it. 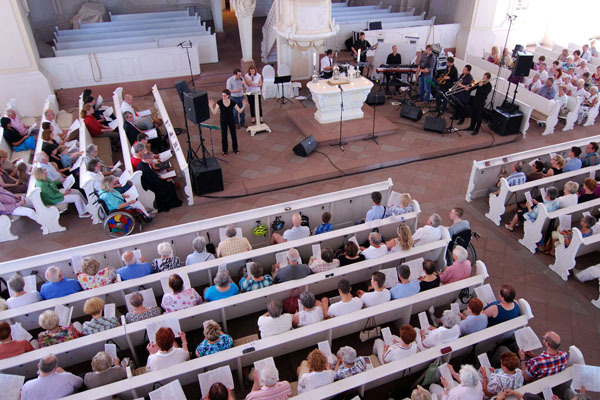 Together with the worldwide Christian community, the local congregation is moving forward as part of the wider Church and at the same time, as part of society, it is involved in social, economic, cultural and political developments. Continuity in diversity is our common mission: to “send out the message of the free grace of God to all people” with enthusiasm and love, as was formulated in the Barmen Theological Declaration in 1934. The Evangelical Church in the Rhineland aims to be a “missionary church of the people”, concentrating on this particular task for all those within its region.